August 2013 – Schwein gehabt? Meatpacking giant Tyson recently grabbed headlines when it announced it would no longer buy and slaughter cows treated with a growth-enhancing drug called Zilmax, made by pharma behemoth Merck. Tyson made the move based on „animal well-being“ concerns, it told its cattle suppliers in a letter, adding that „there have been recent instances of cattle delivered for processing that have difficulty walking or are unable to move.“ According to The Wall Street journal, Zilmax (active ingredient: zilpaterol hydrochloride) and similar growth promotors are banned in the European Union, China, and Russia. 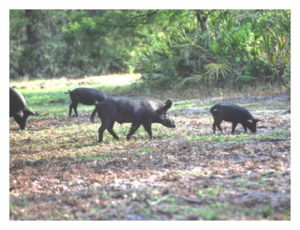 © The Birmingham News File Wild hogs, also known as feral swine, are invading Fort Benning and nearby Columbus, Georgia. Locust Grove, Oklahoma – A few years ago, Jim Vich would not have dreamed of setting up an elaborate trap to catch wild hogs. „They are here to stay and its going to take a huge concerted effort to get the numbers under control,“ said Russell Stevens, a wildlife and fisheries consultant for the Oklahoma-based Samuel Roberts Noble Foundation. 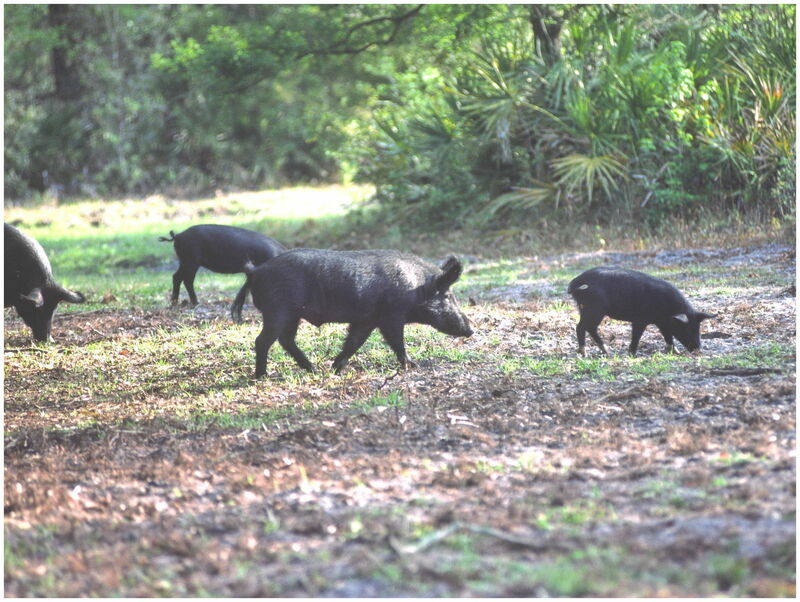 „In states with emerging populations of feral swine, our goal is to eliminate them,“ Nolte said. Torturing Animals With GMOs » CounterPunch: Tells the Facts, Names the Names. Pigs burn in huge lightning storm – The Local. Massive storms hit east and southern Germany on Tuesday night causing widespread damage. The lightning also hit a farm killing 250 piglets. The piglets died after fork lightning struck the Feldkirchen pig sty in Bavaria setting it on fire. In Regensburg lightning hit an apartment block and in Oberisling a tree hit a power line, causing sparks to fly. In the upper Pflaz region in Bavaria, emergency services received 130 calls related to the weather. In Königstein a driver had to swerve violently to dodge a fallen tree in the road, damaging the vehicle. On the A3 motorway a Porsche hit the crash barrier – the driver was not hurt but the car was badly damaged. Despite huge storms hitting the Erzgbirge and Chemnitz area of the eastern state of Saxony, a police spokesman said the region had escaped serious damage. A lightning bolt hit a home in Chemnitz, but the family were not in. Emergency services had their work cut out in Berlin, where they were called out 247 times before 1am. “It was a colourful mix,” a fire service spokesman said, referring to the nature of the calls. “Flooded cellars needed to be pumped, fallen trees cleared and roads drained.” He added that there were no injuries. When the Chinese company Shuanghui International bought US pork giant Smithfield in May—a deal that’s still on hold pending US government review—I read it as another sign that China’s rulers are ready to more or less outsource the nation’s food supply as it emerges as the globe’s manufacturing powerhouse. Since then, two more data points have crossed my desk. The most recent involves this blockbuster Bloomberg piece on China’s emerging coal/water dilemma. The nation’s manufacturing miracle has been largely powered by coal, source of 70 percent of its total energy consumption. And it intends to ramp up its coal-fired electricity massively—by 2020, Bloomberg notes, the Chinese government „plans to boost coal-fired power by twice the total [power] generating capacity of India.“..
Es ist Menschen unwürdig, wenn wir mit Tieren würdelos umgehen. Es gibt ein sehr wichtiges Thema, welches uns sehr am Herzen liegt: Es geht um Schlachttiere denen am Ende ihres trostlosen Lebens besonders Grauenhaftes widerfährt. Um die Tiere vor den Tag für Tag geschehenden, unerträglichen Grausamkeiten zu schützen, haben wir eine EU-Petition gestartet und bitten herzlich um Unterstützung. Wir brauchen Hilfe, um diese Petition in allen Europäischen Mitgliedsländern bekannt zu machen. Bitte leitet unsere Petition per Email, Facebook, Twitter etc. an möglichst viele verantwortungsbewusste Menschen weiter. Den Petitions-LINK zusätzlich auf Eure Homepage zu setzen, wäre sicherlich sehr hilfreich! Links mit dem übersetzten Petitionstext in fast jede europäische Sprache. Bitte gebt Eure Stimme für die hilflos ausgelieferten Schlachttiere. Die Unterstützung und Weiterleitung entscheidet über den Erfolg! Jede Stimme zählt (ideal wäre, wenn auch alle Freunde und Familien- und Vereinsmitglieder unterschreiben)!! Nur zusammen sorgen wir für Veränderung! Factory Farmers Are Hiding the Truth About Swine CAFOs.